Congratulations go out to James Harrison, who scored his first Sports Illustrated cover today. Sure, the occasion is a cover story about devastating hits, but a cover's a cover, right? 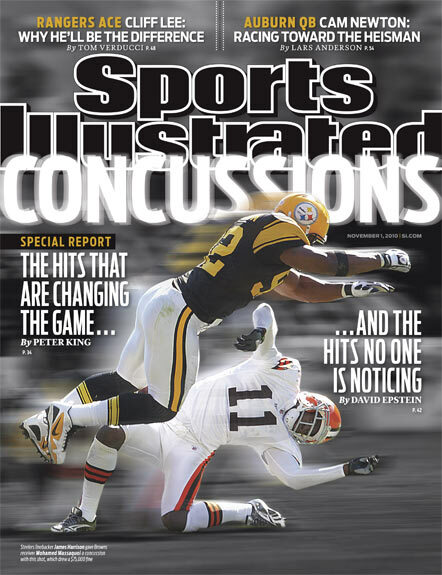 Considering Harrison never left his feet on that hit, you have to admire SI's photoshopping, journalistic ethics. I think it's just that Harrison is so talanted he can magically levitate both of his feet on the same invisible point in space. That's why he's a former DPOTY...and probably a damn good mime also. @ Spatula - Yeah, that's some EXCELLENT photoshopping... What a bunch of BS! Not bad... two 'negative' covers where neither player did anything wrong?